Here are some snazzy birthday facts about 5th of March 1930 that no one tells you about. Don’t wait a minute longer and jump in using the content links below. Average read time of 9 minutes. Enjoy! What day was my birthday Mar 5, 1930? March 5, 1930 was a Wednesday and it was the 64th day of the year 1930. It was the 10th Wednesday of that year. The next time you can reuse your old 1930 calendar will be in 2025. Both calendars will be exactly the same! This is assuming you are not interested in the dates for Easter and other irregular holidays that are based on a lunisolar calendar. What day was March 5 this year? There are 322 days left before your next birthday. You will be 90 years old when that day comes. There have been 32,551 days from the day you were born up to today. If you’ve been sleeping 8 hours daily since birth, then you have slept a total of 10,850 days or 29.71 years. You spent 33% of your life sleeping. Since night and day always follow each other, there were precisely 1,102 full moons after you were born up to this day. How many of them did you see? The next full moon that you can see will be on April 19 at 11:14:00 GMT – Friday. Fun stat: Your first one billion seconds (1,000,000,000) happened sometime on November 11, 1961. If a dog named Neno - a Lakeland Terrier breed, was born on the same date as you then it will be 376 dog years old today. A dog’s first human year is equal to 15 dog years. Dogs age differently depending on breed and size. When you reach the age of 6 Neno will be 40 dog years old. From that point forward a small-sized dog like Neno will age 4 dog years for every human year. View the complete list of March 5 celebrity birthdays. 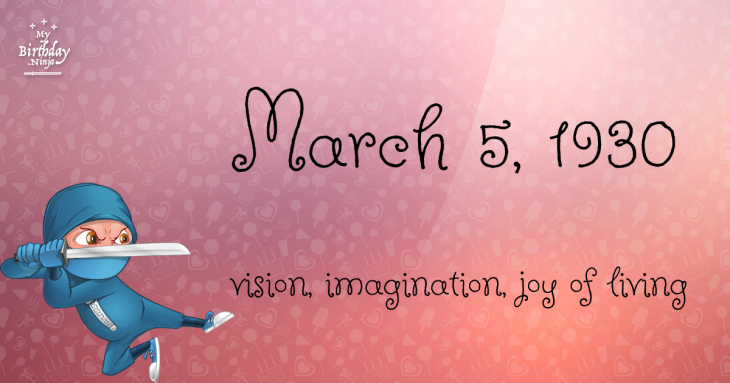 Who are the famous March 5 birthdays? Here’s a short list of famous people in history who were born on Mar 5. View the complete list of March 5 famous birthdays. What happened on my birthday – Mar 5th? Naser Khosrow begins the seven-year Middle Eastern journey which he will later describe in his book Safarnama. Peninsular War: A French force under the command of Marshal Victor is routed while trying to prevent an Anglo-Spanish-Portuguese army from lifting the Siege of Cádiz in the Battle of Barrosa. Samuel Colt patents the first production-model revolver, the .34-caliber. Parma, Tuscany, Modena and Romagna vote in referendums to join the Kingdom of Sardinia. Adolf Hitler’s Nazi Party receives 43.9% at the Reichstag elections. This later allows the Nazis to pass the Enabling Act and establish a dictatorship. Six high-ranking members of Soviet politburo, including General Secretary Joseph Stalin, sign an order for the execution of 25,700 Polish intelligentsia, including 14,700 Polish POWs, in what will become known as the Katyn massacre. Hungarian Communists and Social Democrats co-found the Left Bloc. BOAC Flight 911 crashes on Mount Fuji, Japan, killing 124. Six thousand miners in the United Kingdom begin their strike at Cortonwood Colliery. View the complete list of March 5 historical events. What does my birthday March 5, 1930 mean? Your birthday numbers 3, 5, and 1930 reveal that your Life Path number is 3. It represents vision, imagination and joy of living. You possess a great talent for creativity and self expression. The following celebrities also have the same life path number: Vanessa Hessler, Larry Joe Campbell, Emma Härdelin, Marta Romero, Veronica Hamel, Walter Mosley, Matthew Healy, Meghan Ory, Annette Funicello, Ossie Davis. What is the birthday horoscope for Mar 5, 1930? The Western zodiac or sun sign of a person born on March 5 is Pisces ♓ (The Fish) – a mutable sign with Water as Western element. The ruling planet is Neptune – the planet of dreams and imagination. According to the ancient art of Chinese astrology (or Eastern zodiac), Horse is the mythical animal and Metal is the Eastern element of a person born on March 5, 1930. What is the birthstone for March 5? Fun fact: The birth flower for 5th March 1930 is Jonquil for affection. What is the Love Match for Mar 5, 1930? When it comes to love and relationship, you are most compatible with a person born on March 17, 1943. You have a Love Match compatibility score of +134. Imagine being in love with your soul mate. On the negative side, you are most incompatible with a person born on August 13, 1948. Your incompatibility score is -131. You’ll be like a cat and a dog on a love-hate relationship. Arf-arf, I want to bite you. Meow-meow, stay away from me! What is a good birthday trivia for March 5? What is the popular baby name on 5 Mar 1930? What’s your bizarre Florida Man story? The #FloridaManChallenge is breaking the Internet and social media. Some crazy men, women, or creatures from the Sunshine State are making headlines every day of the year including your birthday. Try this fun exercise. Pick your search engine of choice and type in “florida man March 5” and see what kind of wild news headline you will get. This viral craze started in 2013 and gets resurrected now and then. The latest was from Tumblr and found its way to Twitter. As they say, the rest is history. Here’s a quick list of all the fun birthday facts about March 5, 1930. Celebrities, famous birthdays, historical events, and past life were excluded. Try another birth date of someone you know or try the birthday of these celebrities: December 29, 1946 – Marianne Faithfull, English singer-songwriter and actress; April 29, 1925 – Iwao Takamoto, American animator, director, and producer (d. 2007); May 21, 1918 – Dennis Day, American singer and actor (d. 1988).